TURKEY has often been described as Muslim, but not quite Muslim; Asian, but not quite Asian, even though it is located in Asia. Some prefer to describe it as sitting in South East Europe. It is therefore also European; but not quite. Unlike in most Western European countries, there is a level of cultural conservatism in Turkey that is based on oriental (Asian and Arabic) influences. European views about a possible Turkish integration into the EU have also gone from a total rejection by some, through a “maybe if they changed this or that aspect of their culture or how they run their affairs” by others, to just maybe one day, by another group. Very few people I know are particularly excited by any prospects of Turkey becoming a member of the EU. This is probably what explains the country’s decades long, on and off talks about talks with European Union leaders to negotiate a possible integration. Up to now, the country has also often been described as the only Muslim parliamentary democracy, with political parties contesting elections every five years in order to form a government. But this is about to come to an end following this weekend’s constitutional referendum that saw the Turkish electorate surrender all power to one man, a strong President, and opening doors for him – strongman Recep Tayyip Erdogan – to issue new laws and sign executive orders without going through parliament. It also means that he stands to remain in office for another twelve years without anyone being able to touch him. As part of the 18 proposed constitutional changes he wants to bring in, Erdogan has also reopened a debate about bringing back the death penalty to Turkey; ostensibly to discourage future repeats of the coup attempt that happened in July 2016. This is despite Turkey having introduced Law # 5218 of July 2004, effectively abolishing capital punishment for all times, and later ratifying Protocol # 13 of the European Convention on Human Rights in 2006 in view of a possible integration into the EU. Were this to happen, it would close the door forever to any hope of Turkey being accepted as a member of the European Union. The European Council, which oversaw the ratification of Protocol # 13, would see to that. 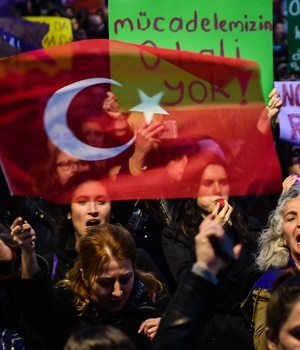 The results of the referendum are being contested by opposition parties and progressive citizens who have already been protesting in the streets of Ankara and other cities. Even if Erdogan manages to stick to his guns, which is likely in that part of the world, it is still hard to imagine how so many people would have voted to give up their democratic right to participate in the affairs of their country through an elected parliamentary representatives to one man. Have they learned nothing from history, if not their own, that of other countries in the region and other parts of the world? Unlike a country like the US which boasts strong democratic institutions, as well as checks and balances that have already been tested against the overzealous President Trump, the new Turkey will soon feel what it is like to live in a dictatorship. Erdogan loves power. He has also proven to be rather paranoid and capable of using his country’s security forces to suppress freedom of expression and other rights. Without independent democratic institutions and a parliament able to contain his insatiable hunger for control, Turkey will soon feel like Robert Gabriel Mugabe’s Zimbabwe, Yoweri Museveni’s Uganda, Omar al-Bashir’s Sudan, Jose Eduardo dos Santos’ Angola, or Teodoro Obiang Nguema Mbasogo’s Equatorial Guinea. There was a time, not in a very distant past, when many South Africans, including this writer, could nonchalantly boast to outsiders who would listen that South Africa would never know any of the political ills that have come to characterise much of the African continent. Sadly, going by recent and ongoing developments in the country, that certainty is slowly waning. The only thing that shields us from going the route of those countries in Africa and elsewhere is the presence of democratic institutions, including the judiciary, that could still play the role of buffer between the ‘still unclear aims of a President desperate to maintain control beyond December’s ANC elective conference’ and hell. The challenge we face in South Africa today, like it was the case in Zimbabwe when Mugabe was on the verge of losing power to one Morgan Tsvangirai in 2013, is to avoid falling into the trap of being manipulated into believing the stories about White Monopoly bogeymen, racism, and the sudden promise of radical economic transformation. We should ask ourselves why now? Why the sudden urgency? Can we believe the aims of a President and his cronies who are clearly under siege, trying to divert our attention from a raft of serious legal issues hanging over their heads? Our challenge, furthermore, is to acknowledge – not in terms dictated by desperate politicians who can see that their days are increasingly numbered – that there indeed remains work to be done to create a more inclusive growing economy and heal the racial fissures that have begun to show their heads again thanks to careless utterances by current leaders. The fact that current leaders are wrong, divisive, and bad for national unity, does not mean that all is well in our country. What we need are more credible, values driven leaders who will enjoy broader public acceptance, goodwill and trust to lead South Africa back on track with building a truly nonracial, non-sexist, and inclusive society. We should never say that the Turkish mistake would never happen in South Africa, because all signs are there. Our emotional investment should be on buttressing our democratic institutions through vigilance and open public participation in the affairs of our country; and not investing in men and women whose true aims we could never predict for sure.